A few years back, when I was researching a book on the history of Bells Beach, the first person I called was John Witzig. Within 20 minutes of the call, I received half a dozen images by email that captured an age when surfing was primarily about discovery, escapism, self-expression and revolution. Funny thing was, not one of them was of a surfer riding a wave. All were portraits of characters that conveyed a mix of innocence, exuberance, irreverence and rebellion. The action shots came later. 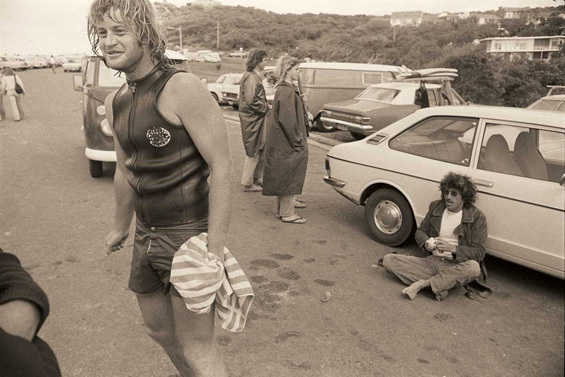 Almost invariably, the subjects had long, bleached hair, wore T-shirts or windcheaters that were unadorned by the logos of the big surfing brands that, at the time, were mere thought bubbles in the minds of surfers such as Doug Warbrick, Brian Singer (Rip Curl) and Alan Green (Quiksilver). Witzig's catalogue spanned the period from the early 1960s, when he first made the trip from Sydney to Bells with Nat Young, to the mid-1970s, when surfing was evolving from its country-soul era into something Witzig found less appealing (and certainly less interesting): the age of professionalism. Most of the pictures he sent me had never been published and had sat, undisturbed, in a bottom drawer for the best part of four decades, after he walked away from a career as an editor and publisher of surfing magazines such as Tracks and Sea Notes. They were the tip of an iceberg that has now been revealed in an extraordinary book that came about because of a friendship forged between Witzig and another surfer-photographer, Drew Kampion, who edited the American Surfer magazine in the late '60s and came to Australia for the world contest at Bells in 1970. About the time I phoned asking for photographs, Kampion made contact with Witzig with another request. A friend was producing a book on handmade houses for New York art-house publisher Rizzoli, and Kampion was hoping Witzig, who studied architecture and had built his own house, might be able to help. That book, by Richard Olsen, featured a picture of Witzig's home at Angourie on the north New South Wales coast and one his filmmaker brother, Paul, built at Cactus, the remote surf spot west of Ceduna in South Australia. Olsen suggested to Witzig that he propose a book of his own surfing pictures to Rizzoli. The story of how this book came about is a neat metaphor for how Witzig, in his words, "snuck into the [self-appointed] role of opinionated chronicler of the times". He started taking pictures because it looked pretty easy and one thing led to another. "John Witzig got lucky when some of his friends got famous", is how he put it. Among those friends are some of the most influential figures in surfing: Young, Bob McTavish, George Greenough, David "Baddy" Treloar, Wayne "Rabbit" Bartholomew and the incomparable Wayne Lynch, who saw a way to surf in a dream and then made it happen. Witzig understood he was witnessing something special from a privileged insider's position. "It was obvious that something was happening and, at a personal level, to be around to observe it was great fun," he writes. "And I did have a sense, even then, that I was recording history." This was certainly the case when Witzig wrote a cover story in 1967 for Surfer under the heading "We're Tops Now", proclaiming the Australians (and notably Young's) ascendancy over the smug Americans and, according to Steve Pezman, publisher of The Surfer's Journal, caused an earthquake. Sometimes, however, the significance of an image only dawned on him later, like the portrait of a very young Reno Aberilla, standing pensively at Honolua Bay between his snapped traditional board and a yet-to-be-surfed V-bottom design McTavish had shaped for him – straddling the past and the future. Appropriately, Kampion writes one of the four essays that punctuate Witzig's pictures and provide the backstory for this body of work – a revolution in design that lifted surfing from riding a board to riding the wave, and unfolded against the backdrop of the Vietnam war. "As the war in Vietnam grew in horror and violence and death, the surfing reality surged into a creative celebration of the essential truth about our relationship with this earth and this time and the gift of the opportunity to ride waves. That's the core of the subject matter that drew Witzig out of the city and into the country," Kampion writes. The result is an invaluable, and more earthy, companion to the photography of LeRoy Grannis, who compiled the most significant record of surfing's golden years from a Californian perspective. "LeRoy Grannis' 1960s images, which are considered seminal, reflected surfing as viewed by a conservative, retired phone company employee who diligently, lovingly recorded what was happening in front of him," writes Pezman in another of the essays, "while Witzig's images, beginning in the latter half of that same period, reflected that he was emotionally and romantically connected to what he was photographing. One is no more or less valid than the other." Now, thanks to a call from an old friend, both are in there to be enjoyed, and no one is more bemused, or grateful, than Witzig.